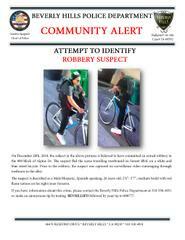 BHPD is continuing to seek community's help to identify robbery suspect. On December 20th, 2018, the subject in the included pictures is believed to have committed an armed robbery in the 900 block of Alpine Dr. The suspect fled the scene travelling westbound on Sunset Blvd. on a white and blue street bicycle. Prior to the robbery the suspect was captured on surveillance video rummaging through trashcans in the alley. The suspect still outstanding and is described as a Male/Hispanic, Spanish speaking, 26 years old, 5'6" - 5'7", medium build with red flame tattoos on his right inner forearm. If you have information about this crime, please contact the Beverly Hills Police Department at 310-550-4951 or make an anonymous tip by texting BEVHILLSPD followed by your tip to 888777.